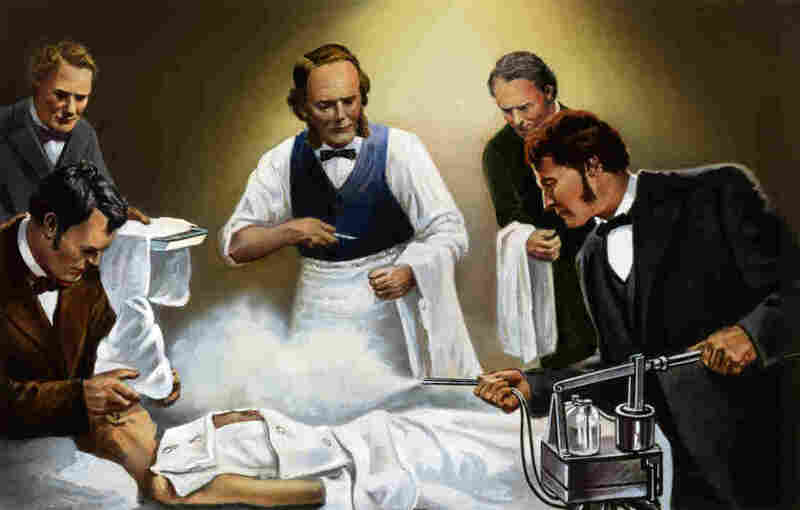 How Victorian Doctor Joseph Lister And Antiseptics Changed Surgery Forever : Shots - Health News Before surgeons accepted germ theory, operations often killed patients. All Things Considered host Robert Siegel talks with the author of a new biography of antiseptic advocate Joseph Lister. Joseph Lister directing the use of carbolic acid spray in one of his earliest antiseptic surgical operations, circa 1865. The operating theaters of 19th century England were dirty, crowded spaces where patients screamed and spectators bought tickets to watch life and death struggles. Surgeons wore blood-encrusted aprons, never washed their hands, and speed was prized over skill, since most patients were awake during surgery in the pre-anesthesia days. Many patients died of infections soon afterward, if they didn't die from shock or blood loss right on the table. 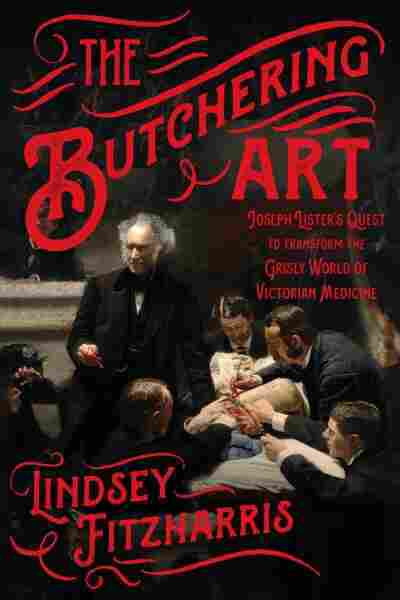 A new biography of surgeon Joseph Lister called The Butchering Art is not about food. It tells the story of how the forward-thinking Lister changed medicine forever by getting other surgeons to understand that germs spread disease but that they could something about it. Author Lindsey Fitzharris tells All Things Considered host Robert Siegel The Butchering Art "is a love story between science and medicine." Lister's technique of spraying antiseptic on surgical equipment (he had nothing to do with the mouthwash Listerine, but his technique inspired it) slowly caught on. And more patients started to survive. "It was hard for people to believe, because here comes this young guy saying there's these invisible creatures and you can't see them with your eye but they're killing your patients," she tells Siegel. "In a plot twist worthy of a public TV period piece miniseries," notes Siegel, "Queen Victoria was a catalyst for wide acceptance of antiseptic surgery." Lister was the closest surgeon to the queen's residence in Scotland, Fitzharris says, so she directed Lister to come drain a large abscess growing under her armpit. Before the surgery, Lister's assistant sprayed carbolic acid with a machine Lister invented called the donkey engine all over the operation area, sterilizing it but also accidentally spraying the queen in the face. "She was not amused," says Fitzharris. "But he ... ends up saving her life. And because she allowed him to do this operation, she kind of gives her blessing to the antiseptic techniques and germ theory by default," she says. "He joked later in life that he was the only man able to plunge a knife into the queen and survive that experience." "He didn't think that was attainable," says Fitzharris. "He never really saw the hospital as the only place a surgeon would operate." In the 19th century, many surgeons operated in homes and offices because middle-class people didn't want to go to hospitals. They were dirty places, and so many people died there, hospitals often demanded money upfront to cover burials. While modern medicine has come quite far since the days of The Butchering Art, it was really not that long ago that surgery was brutal and deadly. But there are innovators like Lister, says Fitzharris. "Medicine and science are always changing what we know about the body, and the world is always changing, and you have to kind of adapt and keep up with that." ATC host Robert Siegel, ATC producer Melissa Gray, and ATC editor Jolie Myers contributed to this story.